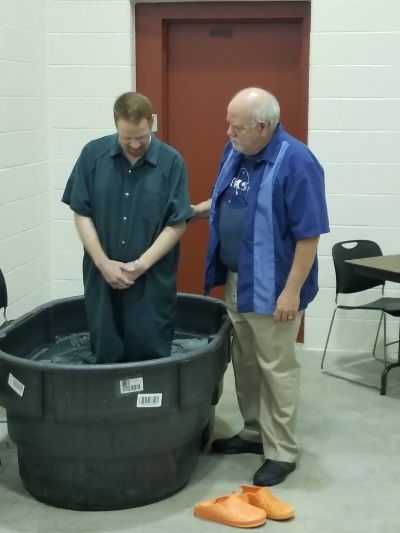 “There were several leaders from area churches gathered together for the baptism service at the jail. Each was sharing about what they were doing with inmates at the jail. I was asked so what do you do? Red is not a color, he is a friend, a brother, a leader. He was an inmate in C-8 at Porter County Jail. We have known each other for several years, and have spent much time with him both in and out of jail. We have always had a great relationship. This time there is something very different. Through his fellowship with others in the POD God has ignited a deep spiritual hunger that goes way beyond his circumstances. He has gone from spectator to participant to leader. "The Bible is the only book I am reading these days I can't get enough. This time the Holy Spirit has done something deep in my life." We meet together each week. He has a stack of notes that he has been taking and sharing. We equipped Red to share the Discovery Bible Study - 10 Stories of Hope. It helps people to discover how to have a relationship with Jesus. He began to share with his bunkie and then others throughout the POD. Soon a DBS (Discovery Bible Study) was formed that began to impact more and more men. In addition to the studies, a prayer call was formed at the end of the night. It began with a few and then grew when Robert showed up in the POD through a prison transfer. Robert is a massive guy covered in tattoos-including his bald head and face. It was a surprise when he joined forces with Red. One night Robert announced in a booming voice, "All right men, it is now time for prayer call!" All of a sudden 30 men joined with this encouragement! 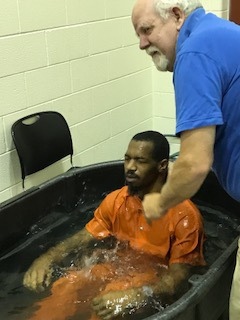 Several men through Red's ministry experienced the wonder of God's forgiveness in Jesus and the hope of eternal life. He prepared them for the next step. . .
BLUE is baptism. Red prepared the men for baptism using a Discovery Bible Study based upon Acts 16, the story of the Philippian Jailer. The baptisms took place on August 28 and September 1. When launching movements it is a blessing to see leaders like Red emerge. When I showed up for the baptism I did not know which men went with which baptism certificate. There were seven men baptized in all including Barrett (Red), Donta, Michael, Christopher, Bernard, John & Damiano. When I baptized Michael (Frazier) I could not resist saying, "Down goes Frazier!" The guys howled. They clapped each time another brother declared his faith. When we were all sitting together, I asked them a question, "What did God do in your lives during your time here in jail?" In addition to hearing about the individual changes that took place in their lives, they shared how close this community was in C-8. 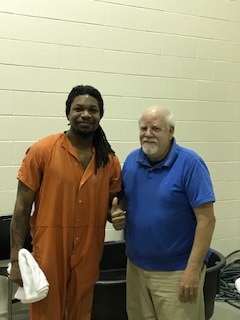 Robert who helped with the prayer circle, wanted to be baptized moved onto prison. Recently I received a call from another brother from C8. "Phil this is John. I learned a lot from Red in C8 at Porter County. 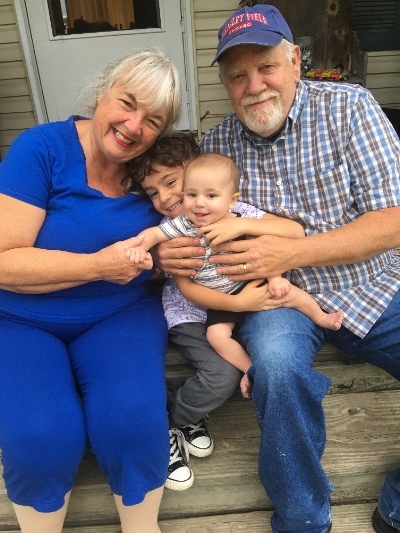 I studied 10 Stories of Hope while there, and I have begun a study with my family since getting out. I missed getting baptized in jail. and want to get baptized now that I am out." Did I forget to mention a fourth color? Green is for multiplication. . .
Red was transferred to the God POD program which is a 24/7 program that focuses on discipleship. Earlier in his stay he had the opportunity, but decided to stay in C8 and minister there. I talked with the guys about the history that goes all the way back to 2009. I told them I wanted to continue to meet with and mentor one of them, as they led others in the POD. The guys pointed to Bernard (see below) who was showing leadership in connection with Red. We will have out first meeting this week. Bernard is the 20th leader to be raised up from the harvest to shepherd the men of C8! SO WHAT DO YOU DO AGAIN? RED: We prayerfully look for people of peace and invite them to do a discovery bible study using 10 Stories of Hope. 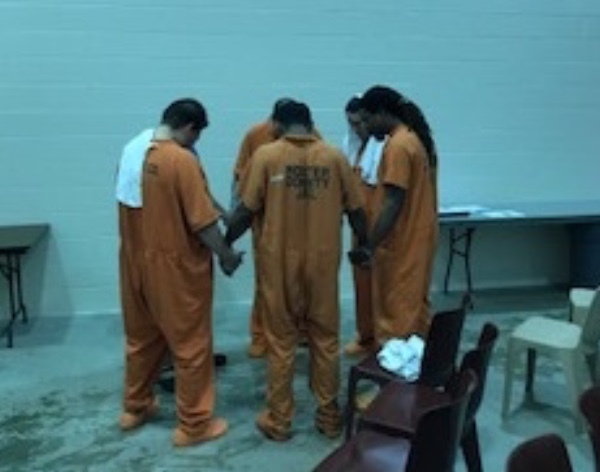 WHITE: We immediately encourage them to begin a Hope Group themselves with fellow inmates to lead them into a relationship with Jesus and walk in obedience with him. BLUE: Those who follow Jesus are encouraged to be baptized as a group at the jail or when they are released. GREEN: As leaders move on we equip them to multiply more groups and we raise up the next leader from the group to take over. We multiply in other PODS, prisons, and neighborhoods. The 'A-Team' in South Africa. We have a vision to see the fulfilment of the great commission through self-replicating, disciple making, transformational Gospel movements in all the nations of the world.